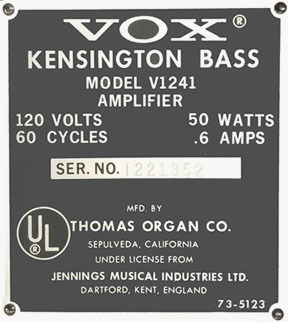 The V124 Vox Kensington Bass amp was introduced in late 1967 and first appeared in the 1968 "The Sound That Travels With The Stars" Vox catalog. 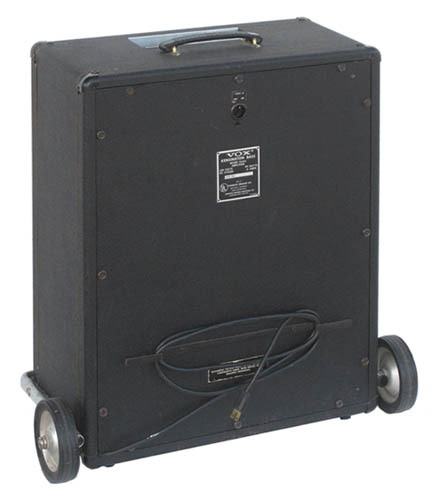 The Kensington was a 22 watt RMS, 45 watt peak bass amplifier with one 15" 4 ohm speaker made by Jensen in Chicago IL. Like the Vox Essex Bass amp, the Kensington Bass control panel was mounted in the top of the cabinet and quite simple. The V124 Kensington control panel had a Volume and Tone-X control, dual 1/4" inputs, power switch, indicator lamp, and a line reverse switch. Several months after the introduction of the V124 Kensington, a revised V1241 version was introduced. 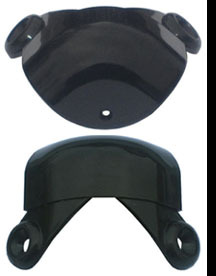 It added a "G-Tuner" feature to provide a reference tone for tuning a bass guitar. Tone-X was a tone control that replaced the normal bass and treble control. Tone-X was a sweepable EQ control that offered about a 6 db boost from approximately 50 hz (control counter clockwise) to 300 hz (control clockwise). The Kensington had a simple "U" shaped cart chrome plated trolley cart with two wheels in the rear. One would tilt the amp back while holding the handle to roll the amp. 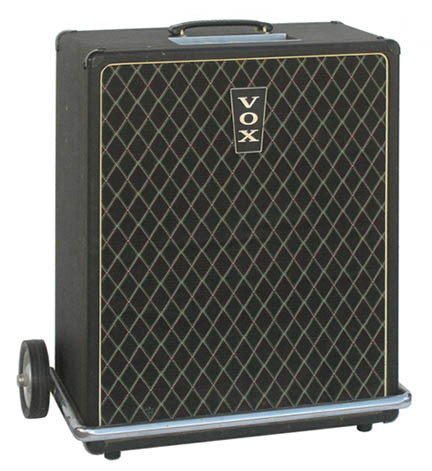 The 1968 US Vox price list indicated that the retail price for the Kensington Bass amp with the accessory foot switch, cover, and rolling trolley stand was $260.00. 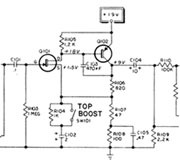 Adjusting the 1968 retail price of the V1241 Kensington Bass Amp for inflation to the current value of the dollar, this amp would retail for over $1600 today. My thanks to Les Haynie of Blue Moon Music in Fayetteville AR for allowing to to take photos of the Kensington amp in his inventory for the Vox Showroom. for the Vox Kensington Bass Amp.